If you have a desire to bring theater feel inside your living room that too without spending a lot of money and by avoiding the use of 5.1 surround system and wire clutters then you are in the right place as we have a better option for you. You can go for a sound bar, a soundbar not only gives out the feel of theater but some of the models also gives you’re the convenience of connecting your device to the soundbar with Bluetooth. A good sound bar will help you in upgrading your television’s tinny in-built speaker, with maximum ease and minimum fuss. With the help of a good soundbar, you can bring the cinema-style sound right in your living room. We have talked a lot about a good sound bar but we are sure that you too must be facing the same problem as our other readers and that is how to decide which soundbar holds the capacity to offer the best buying experience. In case if you too are facing the same dilemma then rest assured as we will help you in making the right buying decision. In order to help our readers, we decided to come up with a list of best sound bars available in the market. The list that we have compiled includes a variety of sound bars with different sets of features, and you will find that the product that we have shortlisted isn’t in the same price range. Just read the reviews to find the ideal sound bar for your living room. The square design of the TaoTronics TT-SK017 gives this sound bar a premium feel and look. The speaker is aesthetically pleasing, and the best thing about this sound bar is that it can match with almost all the home decors. The sleek design and numerous features make this product an ideal option. You can enjoy theater experience right in your home with the help of TaoTronics TT-SK017. 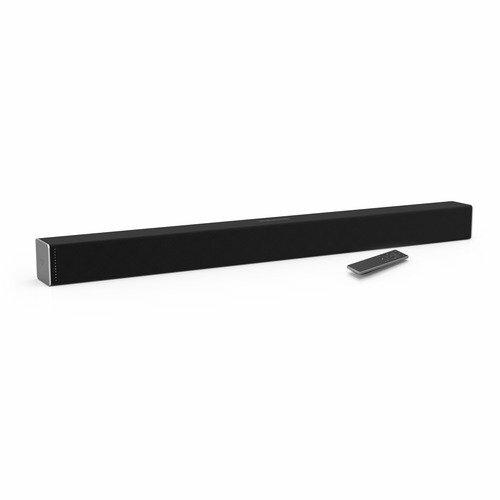 This sound bar is 21” long and thus can easily fit anywhere. You will have the option of connecting your device via Bluetooth or wire (optical cable) for clearer sound. Bluetooth audio quality isn’t that much impressive. To be true Amazon didn’t put a lot of thought into this product specially design wise. You will know that right after having a look at this product. There isn’t much happening in this device design wise. The quality of the product isn’t premium, but you can’t expect more at this rate. The form factor and simple design might work for you if you need a sound bar that can be placed anywhere. The AmazonBasics 2.0 Channel Bluetooth Sound Bar comes with wall mounting kit, which means you can also mount this sound bar on the wall. Sound quality is ok, and streaming music with Bluetooth feels seamless. Rest assured the BÖHM 60W Sound Bar comes laced with Enhanced Vass Technology for delivering next level audio experience. 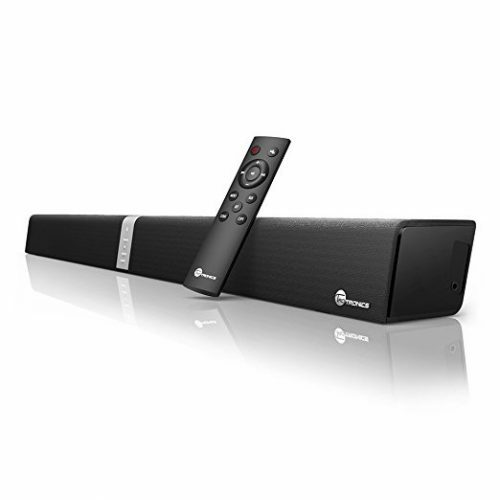 This great sound bar will give you ultimate music, movies, and gaming experience. You should know that though the price of this product is easily affordable, but the unique pro-user features that it packs will leave you awestruck. Believe us this soundbar holds the capacity and right features to lift your entertainment to theater level. The BÖHM 60W Sound Bar is pretty slim and is aesthetically appealing. The slim, compact design will allow you to place this great product as per your convenience. This sound bar uses spatial time delay technique for giving out the best experience. Doesn’t have dedicated power/volume button on the unit. 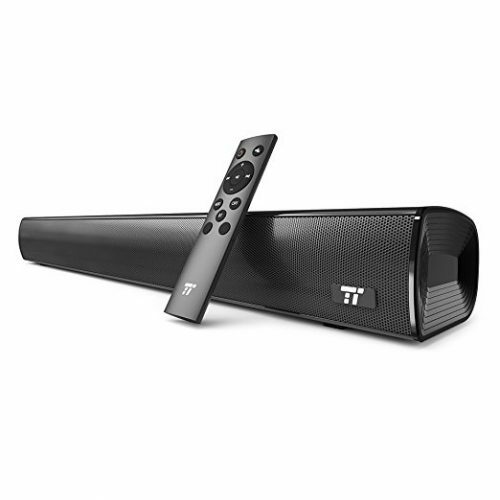 It is true that the design and esthetical appeal of a device isn’t the right criteria to rate it or measure its functionality, but you will have to give it up for the TaoTronics TT-SK15 sound bar. The TaoTronics TT-SK15 packs four drivers that make it capable of delivering impressive levels of volume that to while maintaining definition. If you value aesthetics then for sure, you will appreciate what this product brings to the table. 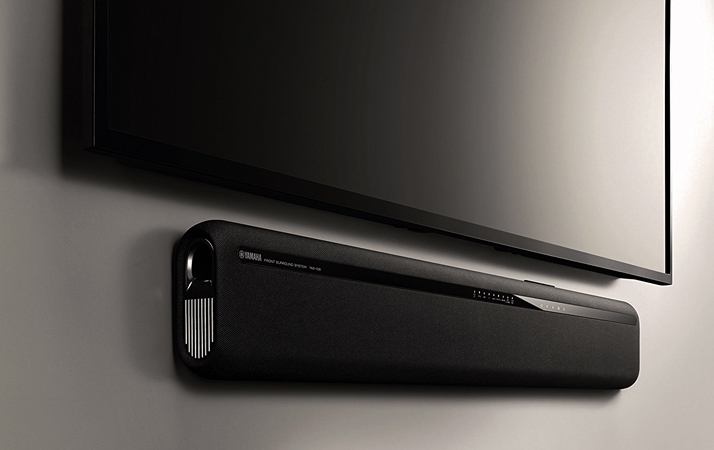 The size of this sound bar might deceive you. You should know that the presence of four separate drivers gives this sound bar the capability for outputting more power that too across all ranges of the audio spectrum. The look, the price and the features of this great soundbar make it an ideal option and a worthy product to be on this list. If you are looking for a powerful sound bar that can give you theater-like experience audio-wise in your entertainment room that too at an affordable price then you should consider buying MEGACRA S9620 Soundbar. This powerful soundbar packs all the features that you will find in high-end sound bars. 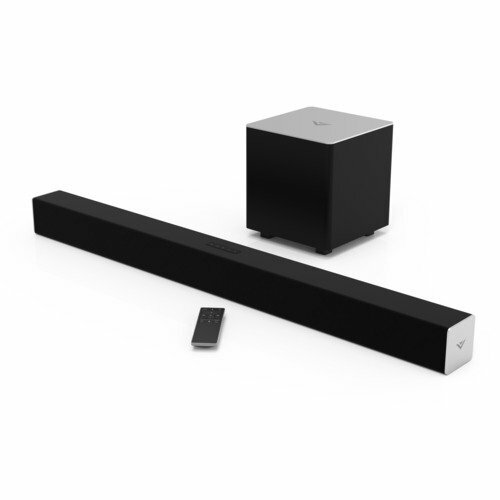 This very soundbar also features DSP technology for offering unmatchable precision and clarity. Strong Bluetooth range allows you to connect your device from a distance of up to 33 feet. If you have a $100 budget for soundbar and a desire to enjoy the best product, then you should definitely have a look at this soundbar. If you are in search of an impressive soundbar that can match the looks of expensive ultra-thin television and give immersive sound quality, then you should consider having a look at Yamaha ATS-1060-R Factory Recertified Refurbished Sound Bar. This sound bar is approximately 35 inches long and can easily fit in almost all the television stands. The slender construction of this sound bar also makes it easy to mount it with your television on the wall. You can also place this sound bar in front of your television as its sleek design won’t interfere with your visibility of television screen. Apart from great design, this soundbar is loaded with features such as the extraordinary bass reflex port, inbuilt dual subwoofers and more. You can buy a better-branded soundbar for the same price. Pyle is a well-known brand as it is one of the most famous companies that make sound systems for cars. The majority of customers of Pyle belong to the young generation. However, you should know that Pyle decided to focus on the realm of home audio with its Pyle PSBV200BT. Well, we recently tried out this sound bar, and to our surprise, they have succeeded in breaking out of the image where they used to gain identity only because of their car audio roots. The black painted wooden frame and glossy-black front panel give this sound bar an impressive look. Playing audio with wired input source surely impresses one, but using the Bluetooth for the same will make you annoyed. 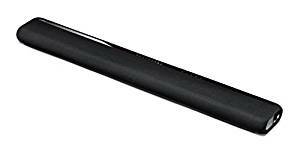 In case if you are looking for a soundbar that too at an affordable price then take our suggestion you won’t be disappointed with the VIZIO SB3820-C6 38-Inch 2.0 Channel Sound Bar. This is a great product quality wise as well as price wise. This very product features minimalist and basic design. So, if you are looking for a soundbar that can bring functionality as well elegance in your living space then go this product. The midrange response of this soundbar is great. The best thing about this soundbar is that it can be mounted practically anywhere. Compared to almost all the immediate competition the VIZIO SB3820-C6 38-Inch 2.0 Channel Sound Bar comes out as a winner in this price range. Doesn’t have the best quality control. VIZIO has gained popularity in the highly competitive industry because of their ability to offer great value for their consumers’ money via their product. If you love simple and clean design, then you will fall in love with the VIZIO SB3821-C6 38-Inch 2.1 Channel Sound Bar just after having a look at it. The combination of two 2.75” drivers along with compact 5” subwoofer will leave you awestruck. The best feature that this very soundbar has is that it includes a Wireless subwoofer in the package. This is surely something unusual as this feature is considered to be reserved for expensive models. With this product, you will surely get the best bang for the buck. Doesn’t dig that deep as low as we expected it to. Yamaha has proved again why it is the best in the industry with its Yamaha YAS-107BL Sound Bar. Though this speaker looks like an ordinary, everyday soundbar, but in reality, it packs way more power than you can imagine. The Yamaha YAS-107BL Sound Bar is a 3-way speaker which means that highs, lows, and mids will be split between 3 different drivers. The 2-1/8 inch woofers and 1-inch metal dome tweeters are very similar to the ones that most of the sound bars in this price range have, but it is the 3-inch active subwoofers that give this product an edge over its competitors. 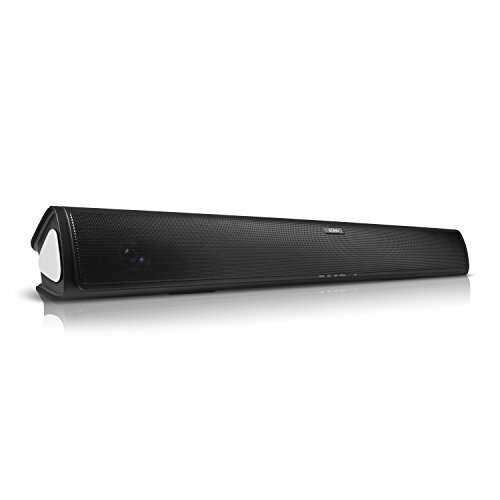 The Yamaha YAS-107BL Sound Bar is a budget-priced sound bar that you will love. We assure you it will be a great addition to your entertainment space. Status lights are exceptionally small thus are only visible when the soundbar is mounted on the wall. In order to shortlist the best products from the never-ending list of available options, we decided to take a few factors such as value for money, build quality, manufacturers reputation, features and price of the sound bars into consideration. With a little bit of research and the help of the reviews of customers who have used this product, we succeeded in compiling the list of best sound bars available in the market. 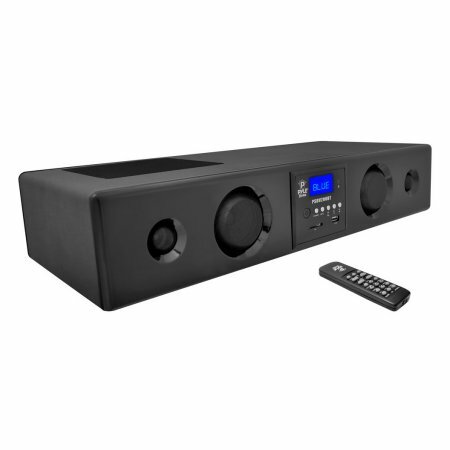 No matter whether you have a tight budget or sufficed budget in your hand you will surely find the soundbar on your list that will meet your requirements and will be under your budget. Don’t wait, just find out which soundbar you want and place an order to experience movie-theater feel in your living room. Rest assured you will be proud of your buying decision. Please leave your suggestions.